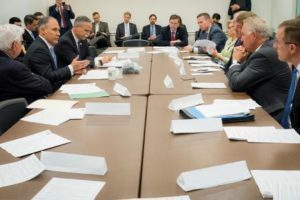 “The war on coal is over.” It’s what EPA Chief Scott Pruitt told the Congressional Coal Caucus on Monday as he met with members to discuss a Trump administration budget that cuts funding for environmental and climate protections. Pruitt told the lawmakers that energy generators would not have to choose between pro-energy and pro-growth. “This administration says we can and we will achieve both a healthy environment and growing economy,” said Pruitt, according to an EPA press release. The EPA indicated those in the coal caucus liked what they heard from Pruitt. “After eight years of devastating attacks on the coal industry from the Obama administration, it is a great relief to have a leader like Scott Pruitt in charge of the EPA. He understands that we can protect our air, land, and water without picking winners and losers in our economy,” said Congressman David McKinley (WV-01). “I look forward to working with Administrator Pruitt, and others at the EPA, to make the EPA more efficient and to recognize that we can work towards cleaner air, cleaner water, and cleaner coal use without killing as many jobs in coal and other industries,” said Congressman Morgan Griffith (VA-09) following Monday’s meeting.